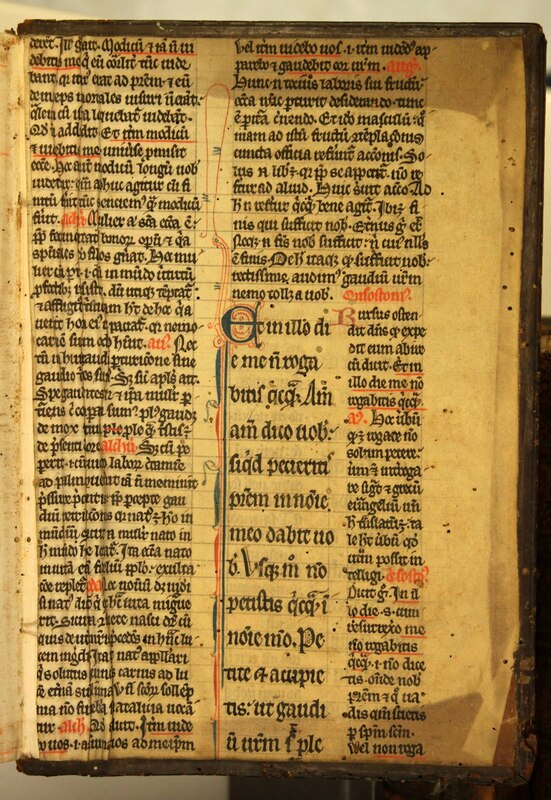 One of the great treasures here in Lampeter is a copy of the Golden Legend printed in 1498 at the Red Pale in Westminster by Wynkyn de Worde. 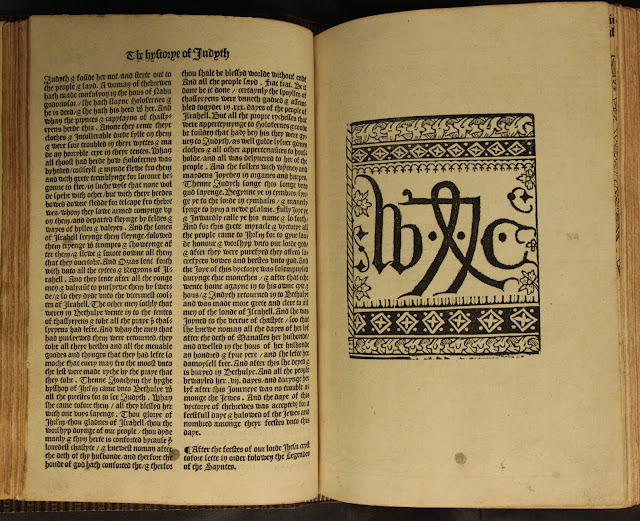 The Red Pale was William Caxton’s printing press, the earliest press to be established in England and this book is a later printing of one that Caxton and de Worde produced in collaboration. 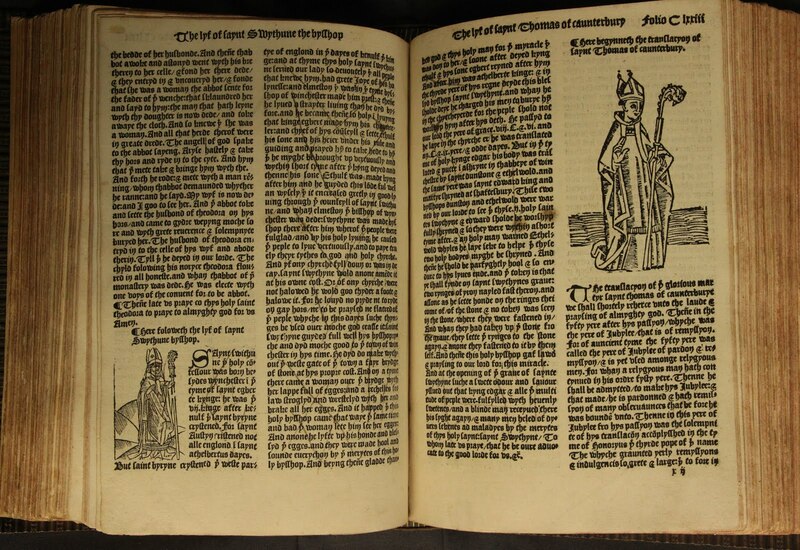 Caxton translated the text of the Golden Legend from Jacobus de Voragine’s original Latin text, and Wynkyn de Worde put the whole thing together, providing the woodcuts that adorn the book and make this the most profusely illustrated of all English Incunabula. 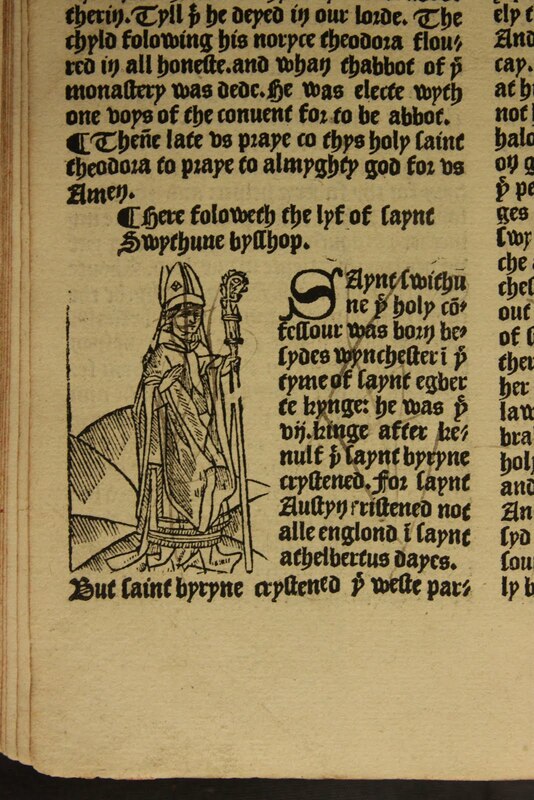 Typically for a Caxton and de Worde collaboration, printed after Caxton's death on his press, Wynkyn de Worde gives a nod to his deceased master, but using his printer's mark (below). The Golden Legend is a hagiographical work, a compilation of stories and legends relating to the saints. Within the book the saint’s biographies are laid out in the order that they occur during the course of the liturgical year. 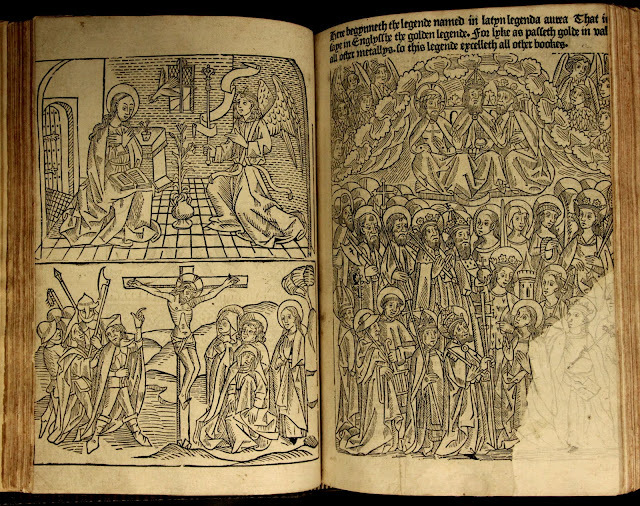 Generally speaking each saint is given an accompanying woodcut by de Worde, though some of these are generic and are repeated many times within the book. As you go through the text, you find that two of the entries for individual saints have been defaced, they have been carefully, but deliberately crossed through with repeated strokes of a quill pen. 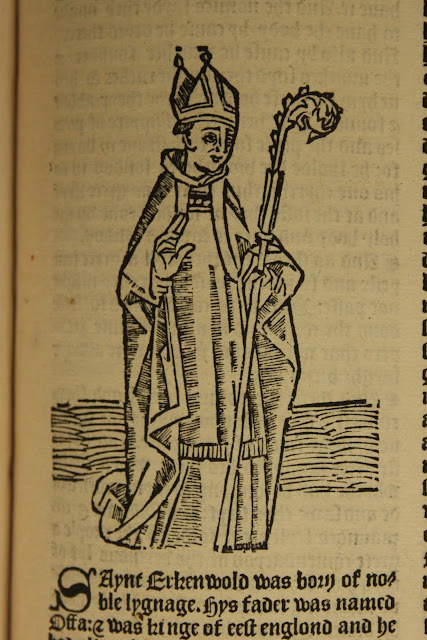 The first is the entry for St Thomas of Canterbury (St Thomas Becket), the second that of Winchester’s bishop-saint, St Swithun (above and below). The cults of both saints were suppressed and their shrines demolished in early 1538 and this treatment of a text relating to them, particularly to Becket, is not that uncommon. As an aside the woodcut that Wynkyn de Worde has used to accompany Becket’s entry is not an image of Thomas Becket at all, but is an image of the Mass of St Gregory, with Pope St Gregory kneeling in front of an altar on which is appearing the body of Christ. You can tell it’s him, because one of the clerics beside him holds a papal tiara. As you continue to look through the book, it is evident that only Swithun and Thomas Becket have been singled out for this treatment and that other English saints that were the focus of prominent cults in the Middle Ages have been spared. St Erkenwald (above), the Bishop of London whose shrine was in St Paul’s Cathedral is left unscathed; as is St Edmund, the king-martyr, whose shrine at St Edmundsbury in Suffolk was a focus of royal patronage. Even St Alban, the protomartyr of England escape. All where prominent late medieval cults and each saints had a shrine destroyed in the late 1530s, so its baffling that they escape the stroke of the reforming quill. Most baffling of all is the treatment of the entry that follows that of St Swithun. It is the feast of the translation of St Thomas Becket’s bones and it has also been spared, despite Becket’s principal feast being crossed out. What a half-hearted attempt at iconoclasm this is! Turning aside for a minute from this ‘iconoclasm’, as you make your way through this extraordinary book, there are various pieces of graffiti that pop out from the margins, all drawn in ink. 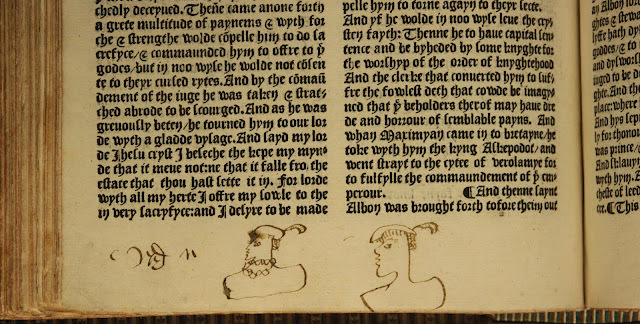 At the bottom of one page are a couple of profile heads both with Tudor bonnets with feathers in their top, one wearing a ruff. At the bottom of another page is the head of a man similarly dressed and smoking what appears to be a clay pipe and on the top of another page is a profile head of a woman. 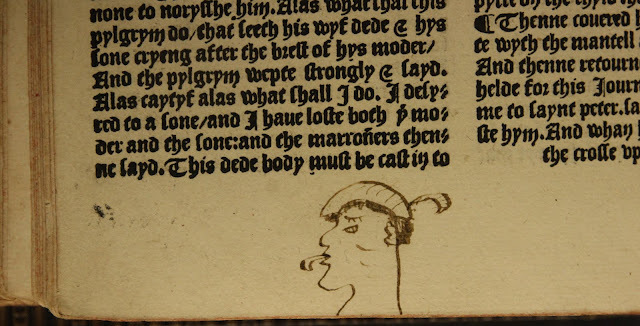 They must be late sixteenth century, is it beyond the bounds of possibility that they were doodled by the hand that held the reforming pen? 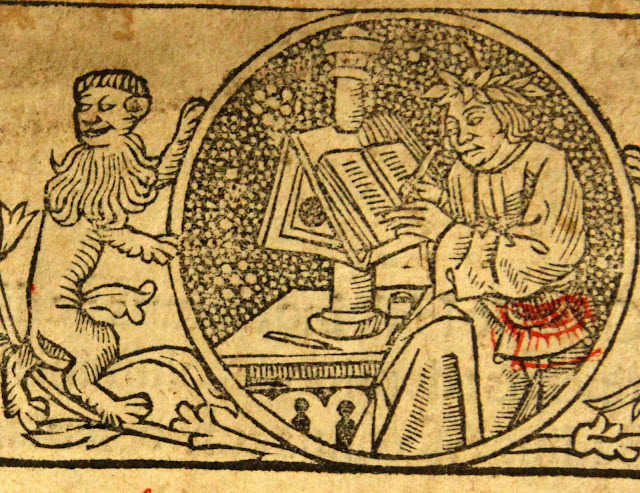 I think I can allow myself a little bit of a digression on this blog from binding, into the extraordinary world of bibliography, as we take a look at the frontispiece of this splendid early printed book. 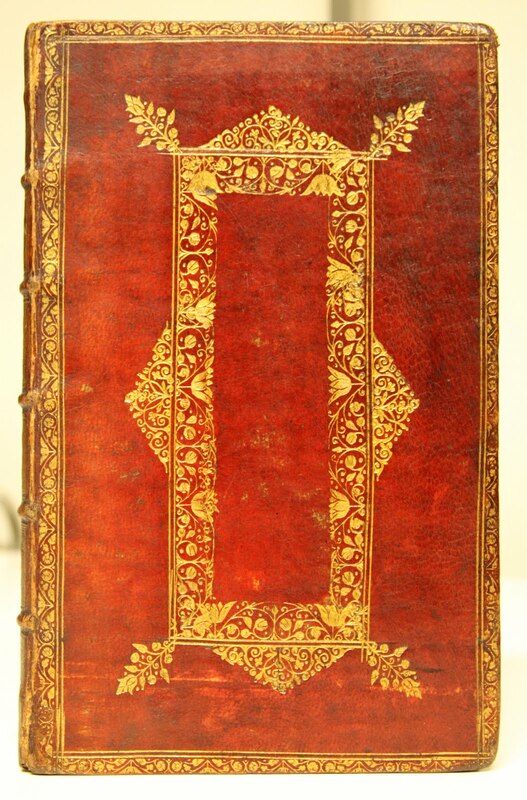 This book is an edition of Livy's History of Rome and was published in Paris in 1516. It was published as a joint enterprise by the two major Parisian printers of the age: Jehan Petit (who was using the alias Joanne Paruo) and Jodocus van Ashe Badius. 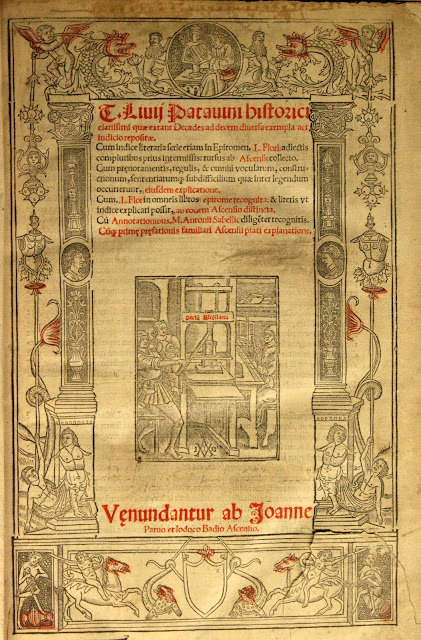 Although they jointly funded the printing of this book and as the title page suggests they sold the book in both of their respective shops, the Colophon of the book makes it clear that the book was printed by Badius in his print shop which was called the Praelum Ascensianum - the Ascension Press. In a wonderful bit of marketing in the book's Colophon, Petit and Badius claim that this particular book was a new improved edition of Livy's History and was the most accurate available to the academics of Paris! 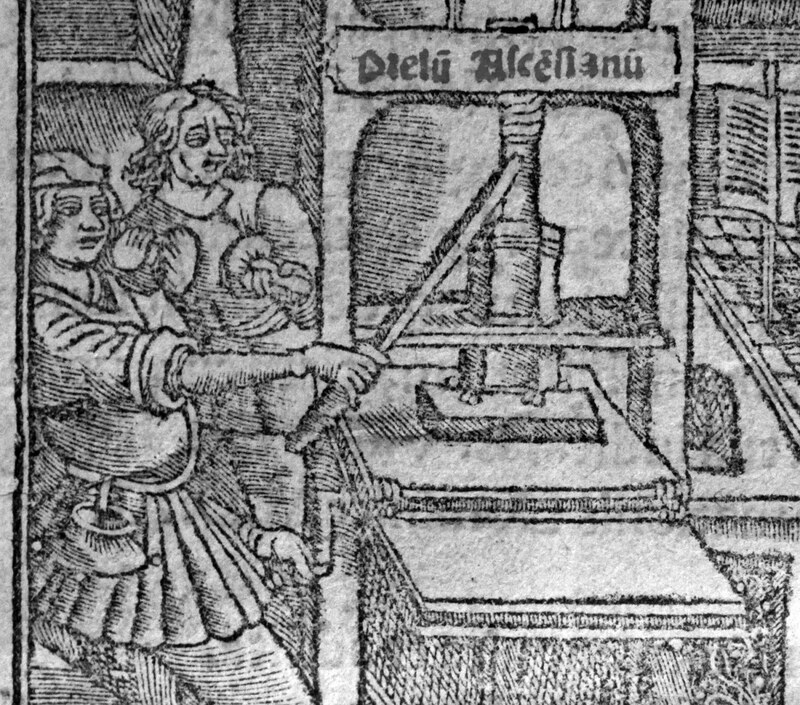 Now we say that Petit and Badius were printer's, but they were not press men, they wouldn't have got their hands dirty. They were print shop proprietors, speculators, Publishers if you like. It seems that Both Petit and Badius, Badius particularly, were men of considerable intellect and learning (see sources below), who were quite capable of producing accurate texts of important Classical works. The title page of this book is wonderful, full of detail and full of meaning The text is set within a lovely little classical structure with pilasters and profile heads in medallions hanging from them, evoking the architecture of Ancient Rome. Around the classical frame are lots of marginal details: Renaissance Putti, suits of armour eluding to the martial history of the Roman Emperors and various mythical creatures. 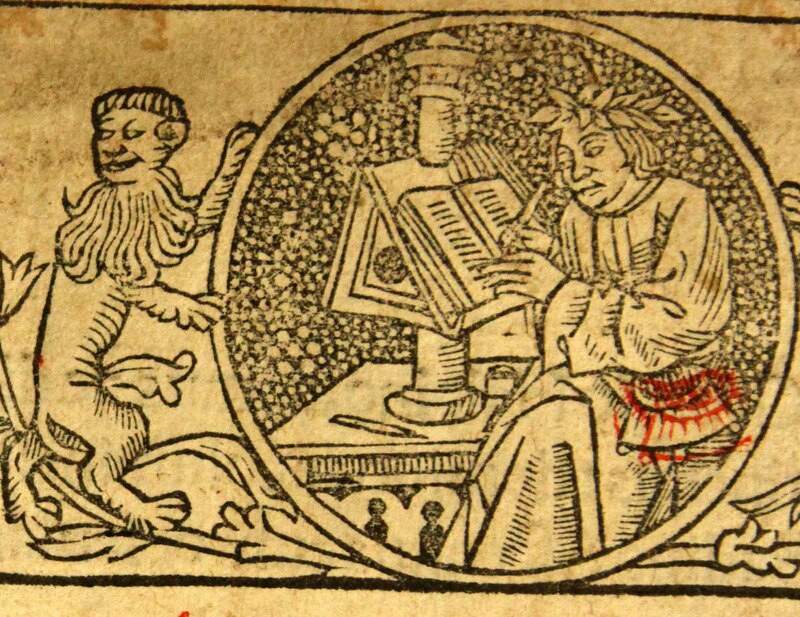 At the top is a man in a roundel flanked by two lions, busy writing away at a book on a lectern - is this Livy himself? 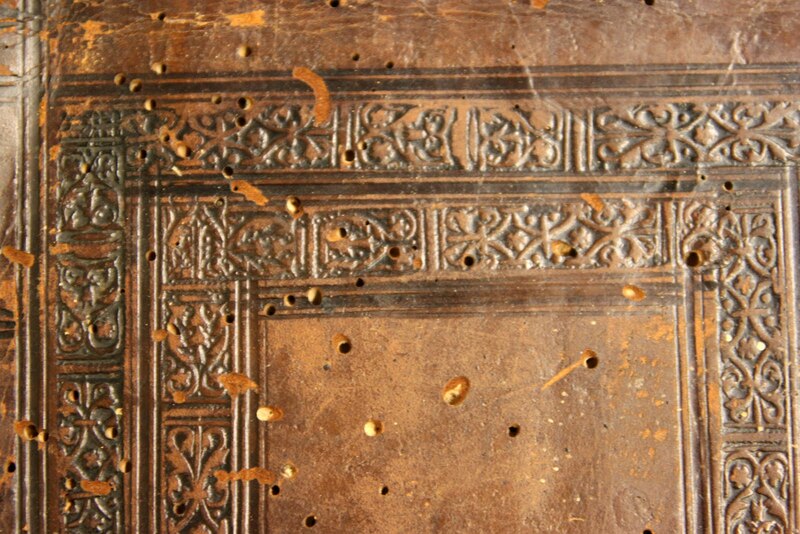 This particular wood engraved surround is used in other printed works coming off the presses of Petit and Badius. Here is an example from another of their collaborations, it has at it's centre the printer's mark of Petit and was printed at his press rather than that of Badius. So clearly the two men were sharing their resources when there was call to do so. Back to the Lampeter copy of Livy's History and on the frontispiece of this collaboration the printer's mark this time is that of Badius. It's a wonderful representation of the interior of Badius' print shop the Praelum Ascensianum. 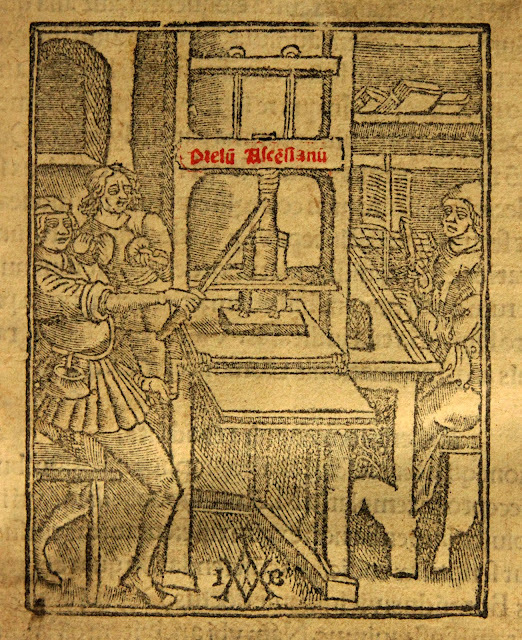 At the centre of the image is the very printing press that this book was printed on, with the name of the print shop clearly printed in red upon it. At the bottom is the monogram of Badius: A(VA)B - for Jodocus van Asche Badius. There's lots going on in this image and we can learn a lot from it about the process that went into producing a book like Livy's History. As I said the press is in the middle, it's a wooden press with a wooden screw mechanism. The press man is on the right hand side of the press. With his right arm he is he pulling the handle, that will turn the screw, that will apply pressure to the 'platten', which will 'press' the inked type onto the paper. With his left hand he is about to turn the 'rounce' the handle that is connected to a windlass, that operates the 'bed' of the press, or as they called in the sixteenth century the 'coffin'. This 'coffin' contains the 'form' into which the cast metal type (the letters) is set and over this is placed the 'tympam' which contains the paper that is to be printed. The man behind the press man is his assistant and he is holding in his hand two ink balls. These ink balls have wooden handles and are made of leather stuffed with wool and are used to spread the ink evenly on the metal type. When the press man draws out the 'coffin' and as he removes the newly printed piece of paper, the assistant jumps in quickly, inks the type using the balls, before another piece of paper is put in and the press is pulled again. Having two men working the press, a press man and an assistant, significantly increased the output of the press. Now on the right of the press is another man, he is seated on a bench; he is the typesetter or compositor. 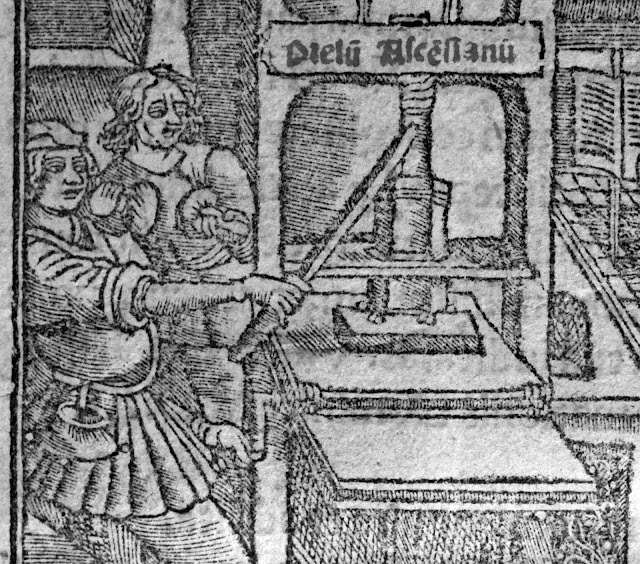 In his right hand he has a composing stick and with this left hand he is reaching out to pick out the metal type, the individual metal letters. He transfers the metal type into the stick in readiness for its transferal to the form. Notice how his eyes are focused not on the type or the stick, but on the piece of text that hung up in front of him, this is the proof text he is copying. An experienced compositor would be able to set type without looking down at the trays containing it. For Petit and Badius, the accuracy of the texts they were producing for the French academic market were clearly an important selling point. The accuracy of the text was in the hands of the skilled type compositor and the clarity of the printed text in the hands of the skilled press man. Bringing the Blog back on track for a minute, the volume is an a nice early sixteenth century binding of blind-tooled Calf over wooden boards and with the remains of gorgeous metal clasps. Bur. 03005 - John Cosin - Historia transubstantiationis papalis : Cui praemittitur, atque opponitur, tùm S. Scripturae, tùm veterum Patrum, & reformatarum ecclesiarum doctrina catholica, de sacris symbolis, & praesentia Christi in sacramento eucharistiae. Hanc autem disquisitionem historicam ante annos XIX scribebat, & demùm instanti mutorum rogatu excudi permisit paulo ante obitum Joh. episcopus Dunelmensis - London, 1675. What a fine little book this is, printed in 1675, it's still in its contemporary trade binding and is almost as crisp as the day it was printed and bound. The leather binding is red 'Morocco' Goatskin, with elaborate gold tooling and is typical of the period. After a generation of Puritan influence, with the Restoration in 1660 and Charles II's return to England from his exile in France, the English embraced all things French, particularly the prevailing French Baroque style. All areas of the visual arts where influenced by this new French style, bookbinding included and you can see that in this binding. The richness of the exterior of this book is continued when the book is opened. The pastedowns to the front and back are made from decorated marbled paper, which has beautiful swirling and serrated patterns in red, yellow ochre and Cobalt blue paint. This marbled paper is decorated using a technique that originated in the near East and came to Europe during the sixteenth and seventeenth century. The 'marbled' papers used in the English bookbinding trade from the 1660s, were not produced in England, but primarily in Holland and northern France and were imported into London. The pattern used here is a pattern that is known in England as 'Antique Dutch', indicating its continental origins. The use of marbled paper in late seventeenth century English bindings was an embellishment that was as exotic and as Continental as the fashion for gentlemen wearing full bottomed periwigs. Making marbled paper is a complex and skilled craft and there are many variables that can go wrong. Believe me I've made it and have many sheets of badly printed marbled paper to prove it! You begin the process by filling a large shallow tray with a size made from soaking and boiling up Carageenan moss. You mix up your chosen colours using water based paint, to which is added a drop or two of Ox Gall. The Ox Gall is an agent that enables the paint to spread on the surface of the size when it's dropped on it. My marbling tray with rather murky looking size after completing a significant amount of marbling. The pigment is then dropped or sprinkled on to the surface of the size with a brush or a feather and will then spread out over the size. Put too much Ox Gall in and it spreads too much, put in too little and the paint sinks! Once the different colours are applied to the surface you can begin to create a pattern. This can be produced by running the point of a stick through the paint to create swirls and curls, but to create the serrated patterns typical of the 'Antique Dutch' used in Bur. 03005, a special marbling comb must be used. This comb is a wooden frame which contains a series of teeth made from wire and these are drawn through the size to create the pattern. When the pattern is complete, a piece of paper treated with Alum is carefully laid on the top of the size and this then picks up the pigment. Without this Alum treatment the paint won't be 'mordanted' to the paper and it just falls right off. The paper is then rinsed and left to dry. 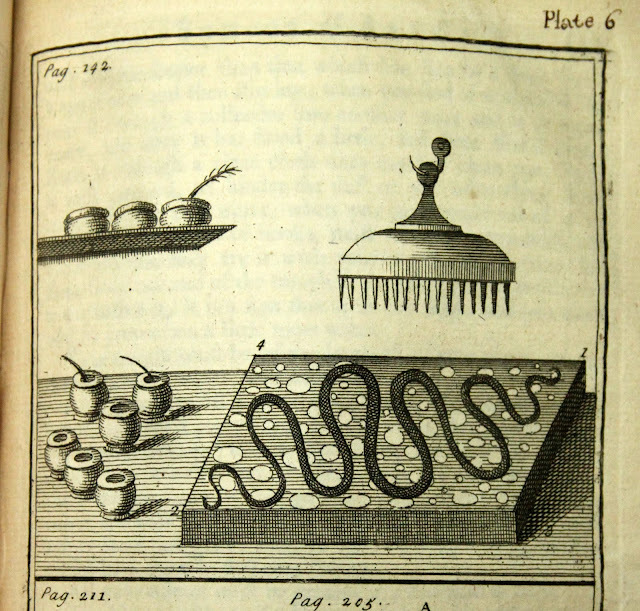 The illustration above from a book entitled The Laboratory printed in 1740, shows the tools used in the process. To the left are the pots of paint with the feathers used to drop the paint onto the size. The bath of size is in the middle and the paint has already been dropped onto the surface of the size, there are a series of light coloured droplets and a darker snake like band of paint. Above is the comb ready to be applied to the surface to make the 'Antique Dutch' pattern. Generally speaking once the paper was dry it was given a waxy coating, that gives it durability and could then be used by the bookbinder. The paper in Bur. 03005 has been treated in that way. Eventually this technique caught on in England and by the middle of the eighteenth century there were marbling workshops in London producing English marbled paper. Gradually a whole range of different patterns and forms developed and I may well illustrate some of these in a later post. 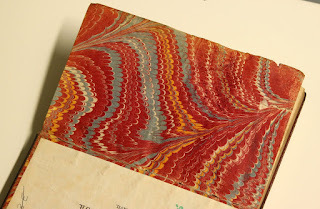 Below is a video on Youtube that shows marbling taking place in the 1970s in the studios of the Cambridge bookbinder Cockerell's. It gives you a good sense of just how involved this extraordinary process is. An Oxford binding and a medieval Bible commentary. Phi 02278 - Phi. 02282 - Digestum nouum : Pandectarum iuris ciuilis tomus tertius sextae partis reliquum ac septimam eandemq[ue] nouissimam digestorum partem continens, ex Pandectis Florentinis ita in vniuersum recognitus ac emendatus, vt nihil ... desiderari possit : ad[i]ecimus pluribus locis annotationes ex varijs ijsdemq[ue] classicis autoribus ... nusquam antehac euulgatas. Lugduni : Apud Hugonem à Porta & Antonium Vincentium, 1551. These books are a set of five volumes of the Emperor Justinian’s ‘Corpus Juris’ and were printed in Lyon in 1551. This was a standard work of Roman Jurisprudence, which influenced both Canon and Civil Law from the middle of the sixteenth century. The five volumes were imported into England and were bound uniformally not long after printing. The bindings are of dark brown Calf and are tooled in blind, panelled into four concentric rectangles with a fillet of a thick and two thin lines. A roll decorated with an arabesque pattern, has been run around the second and third rectangles. A single and a double line fillet are used to decorate the otherwise plain spines. 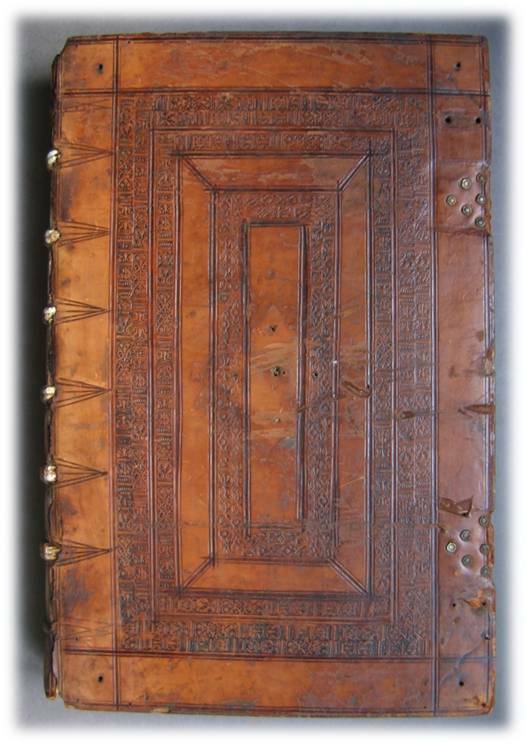 The binding is a typical product of the Oxford binderies of the sixteenth century. All five volumes are in poor condition and are kept in conservation boxes. 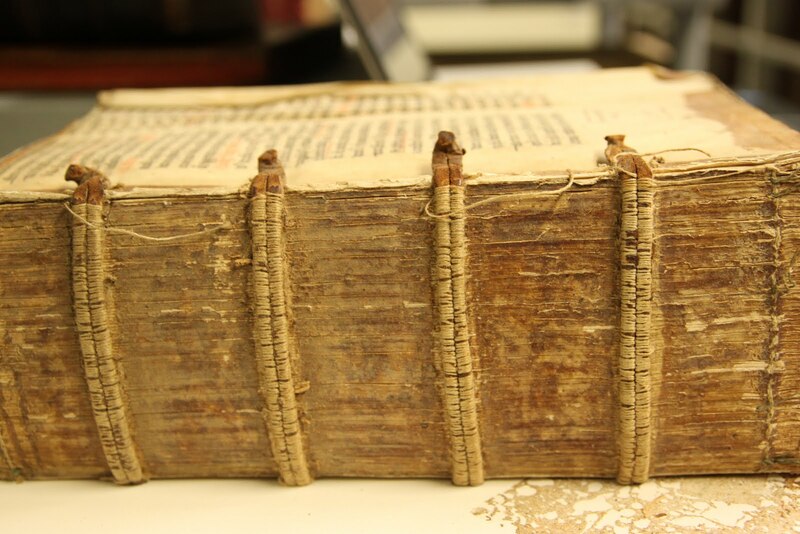 In the case of two of the volumes the covers have become detached from the text block and these give a rare and valuable view of the underlying binding structure of the books. The books are straightforwardly but robustly bound, as you would expect from a set of text books used by scholars. 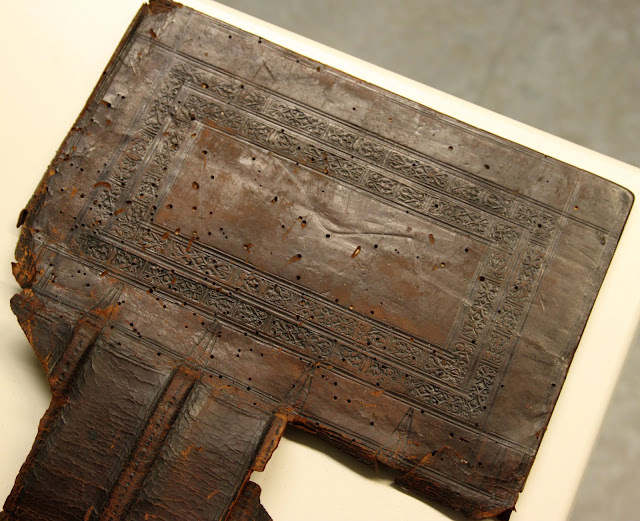 As is typical for the book of this date, the quires are sewn onto split leather thongs that are let into wooden boards. The spine has been glued, but not lined. 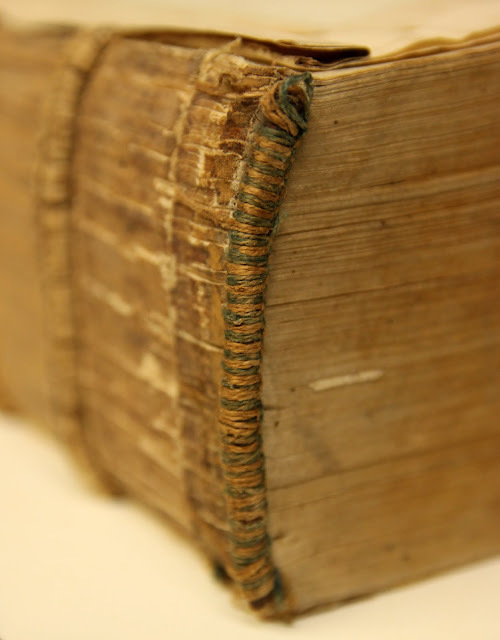 When covered with the leather, these split thongs produce the very thick and pronounced raised bands on the spine that are characteristic of a late sixteenth century binding. You can see them on the leather of the spine in the photo below. The original endbands remain on some of the volumes on the set. Where they exist they are also uniform, worked over a leather thong with alternating blue and white linen thread, which would have been quite bright when the book was first completed. 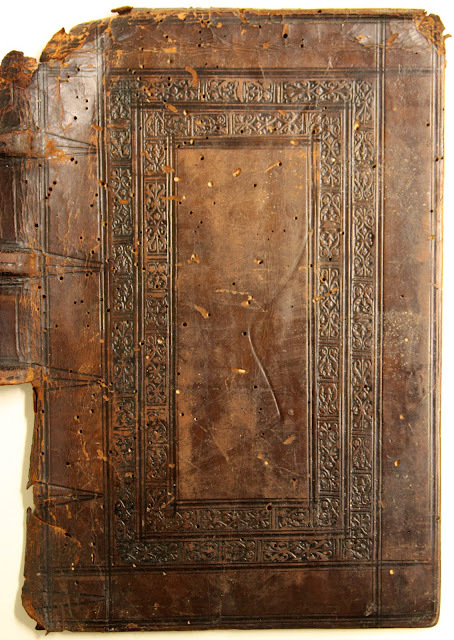 Again typical of Oxford bindings of this period, the boards of the books are lined with reclaimed manuscript. The front and back pastedowns of all five volumes are formed from sheets of parchment waste, pages from the same medieval manuscript. The manuscript is a thirteenth century Gloss, a commentary on the Gospel of St John, perhaps the Glossa Ordinaria. On each page the text of the Gospel of St John is in a larger hand, with the glosses, the commentaries on the text placed around them. The glosses are taken primarily from the works of St Augustine of Hippo, but also from Alcuin, St Jerome, St John Chrysostom and St Isidore of Seville. 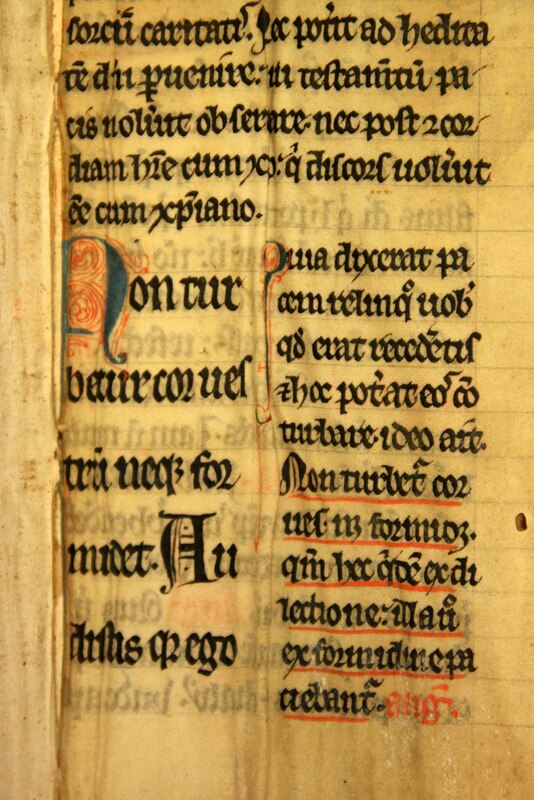 The page illustrated above shows the text of John 16, verse 23, surrounded by glosses from Alcuin, Augustine and John Chrysostom. Copies of the Glossa Ordinaria where mass produced from the middle of the thirteenth century, they were texts that were in common use within the Universities. It is tempting to see the manuscript waste as a victim of the Reformation, perhaps plunder from the Monasteries. 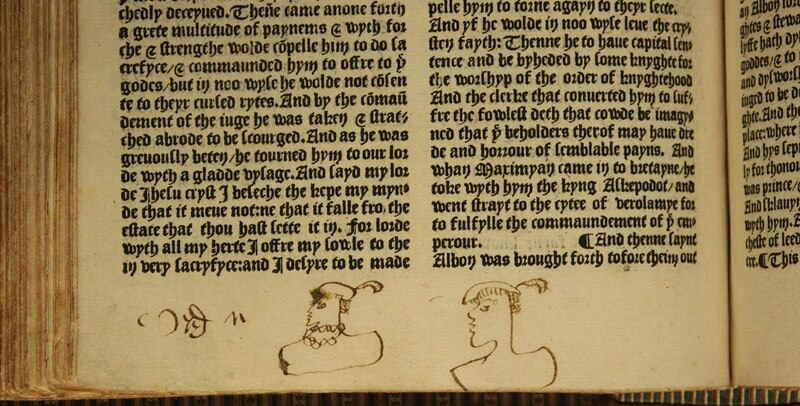 However, it's just as likely that the manuscript was a victim of the development of the print trade. Thousands of medieval manuscripts were flooding the market in the sixteenth century, particularly in University towns, having been replaced by more reliable printed versions of the texts. There is some tantalising inscriptions in the book that hint at a possible provenance and also might indicate the cost of the set of books at the end of the sixteenth century when newly bound. Phi 2282 has the inscription on the title page: ‘Johannes Jenour me possidet’ ‘John Jenour, owns me’ in an early sixteenth century hand – and what appears to be the cost of the set of books ‘iii.li xiii.s …’ (£3 & 13 shillings), a significant sum. The same inscription occurs on the back paste down too, with more text below it, sadly indistinguishable due to water damage. In the same hand below the title is written twice: ‘Initium sapientiae timor dei’ - ‘the fear of the Lord is the beginning of wisdom’. It’s not certain who Jenour was who bought this set of books for the considerable sum of £3 and 13 shillings, but a Johannes Jenour, alias John Jener or John Jeynor was Vicar from 1572-1580 and then Rector of Great Bardfield in Essex from 1580-1616. L. Smith, The ‘Glossa Ordinaria’: The Making of a Medieval Bible Commentary, (Leiden and Bosto, 2008), p. 73. 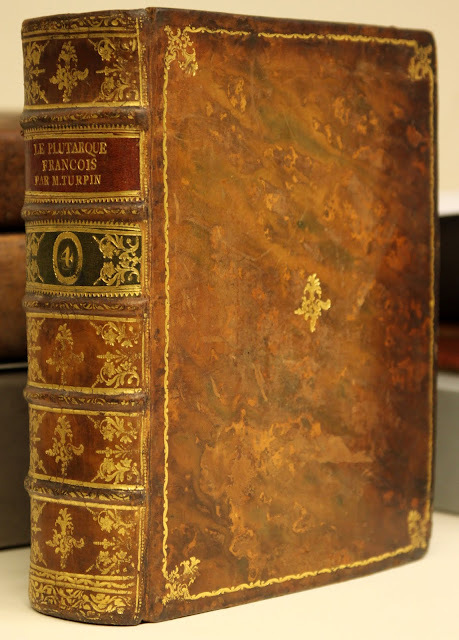 This book is one volume of a four volume set of Francois Turpin’s popular ‘French Plutarch’. This is an eighteenth century work emulating Plutarch’s Lives and contains the biographies of famous Frenchmen, including generals, statesmen and lawyers. The four volumes were issued between 1775 and 1786. At they are bound as a uniform set, probably in the last decade of the eighteenth century. The binding, which is almost certainly French too, and is very fine indeed and given its rather lavish decoration was probably undertaken for a rich client The decorative treatment of the leather is visually harmonious. 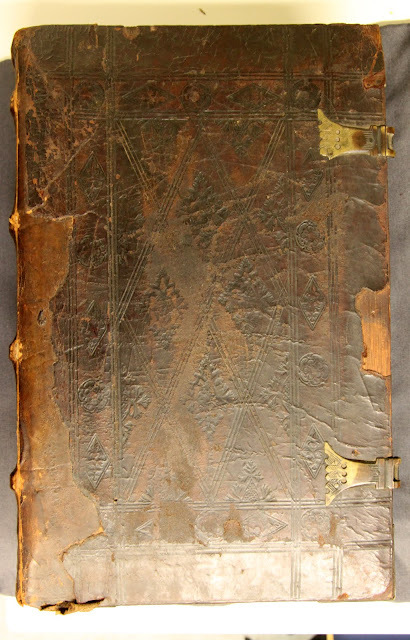 The binding material is Calf, which has been marbled on the front and back boards. Gilt tooling has been used in a typical late eighteenth century manner. It is restrained on front and back boards - the only decoration with a narrow roll applied around the edges and corner and a foliate centre tool applied. The spine on the other hand has received heavy gold tooling, with the centre tool used on the boards also used at the centre of each compartment. Red and green patch labels have been applied for the titles, the green of the leather labels echoing the green tones within the marbling of the Calf. The decoration is harmonious and very, very elegant. However, all this sense of harmony and elegance vanishes when you look at the edge treatment of the book. It is quite common to find book edges decorated, either with marbling, a sprinkled pigment finish, or with solid gilding. On the edges of this book, the binder has decided to use two treatments in combination, paste painted decoration and gilding and the resulting effect is opulent. On both ends of each edge the binder has created panels of gilding with convex sides and the space in between has been decorated with swirly patterns created in wet Cobalt blue paste. The gilding is decorated with a line of gauffering. At some point the fore edge and top edge have been exposed to the sun, but the bottom edge has been spared; so you get the original richness of the blue colour full throttle when you look at the bottom of the book. This edge treating is very striking indeed, an ostentatious and rather cheeky bit of decoration, which of course would only be seen when the book was taken from the shelf. When looking at the leather decoration and edge decoration together, you are left wondering whether it makes for a coherent and visually united whole. Though I'm sure that didn't concern the original client one bit. Just a quick post for you today, really just to demonstrate the potential there is within the study of bookbindings to give a glimpse into the past. Although it was printed in Frankfurt, this book was imported into England and was bound in an English Calf armorial binding soon after it's arrival here. 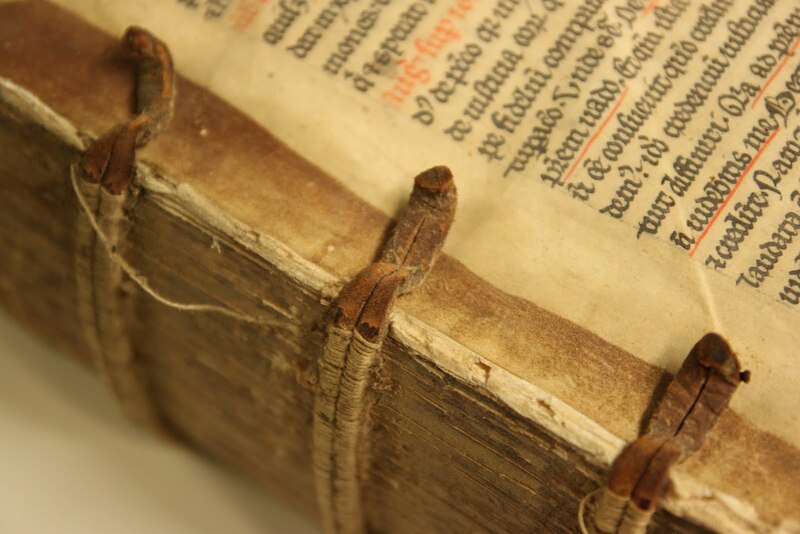 In the structure of the binding pieces of recycled manuscript are used to strengthen the joints. The scraps of manuscript material are very badly creased and cut up and consequently quite tricky to read, but they do include some identifiable bits of plainsong music. 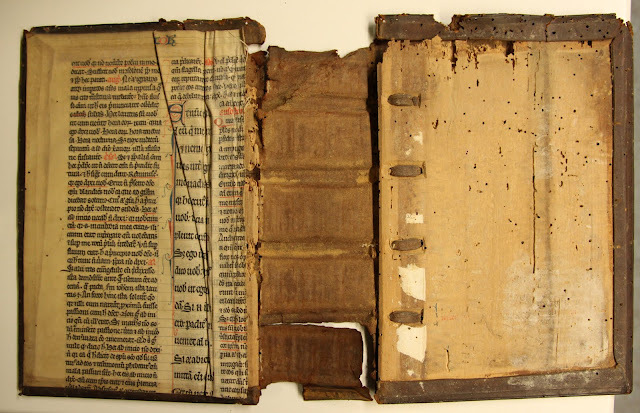 There is enough here to indicate that the scraps of music are recycled from a book called an Antiphonal, a book containing Antiphons, responsories sung by a choir in church during the divine office. They appear to be early fifteenth century. Among the scraps here is the plainsong setting of the the words ‘ut convertat corda patrum...’ (to turn the hearts of fathers). This formed part of the Antiphon Ipse Praebit ante illum’, a setting of the words of Luke chapter 1, verse 17, in which Gabriel foretells to Zechariah the birth of his son St John the Baptist. 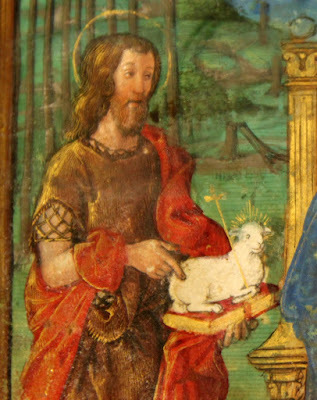 It was the Antiphon sung at Matins on the feast of the Nativity of St John the Baptist. Paste Paper, Melancholy and a book belonging to Democritus Junior. This tiny book is among the books of Bishop Thomas Burgess. For all you Welsh medievalists out there it’s a Latin abridgement of a collection of histories of Britain, including those of Geoffrey of Monmouth and Gerald of Wales. Virunio produced this abridgement in the early sixteenth century for the Italian market, but this edition was printed in 1585 in London. Looking beyond the text, the book’s binding dates from the early eighteenth century and is particularly attractive. It’s bound in quarter Calf, with a gilt patch label and boards covered in a lovely red paste paper, decorated with swirly patterns. This form of decorative paper was used widely in the seventeenth and eighteenth century on library bindings and was made by mixing pigment with wheat paste. The resulting coloured paste was applied to the surface of the paper and then a tool or the maker’s fingers, were moved through the wet paste to make the patterns. When dried the resulting decorative paper was hard wearing as well as rather beautiful. 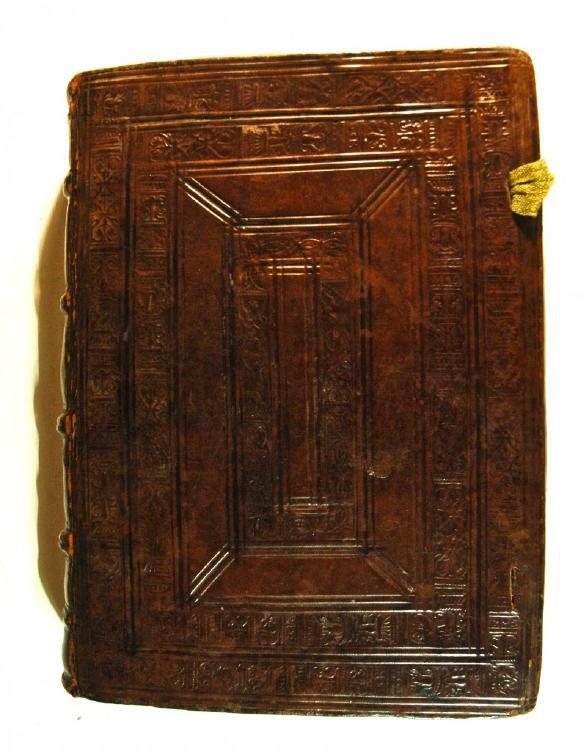 As well as being an interesting work of history in an attractive binding, the book has a fascinating provenance too. On the pastedown is the bookplate of the library of Christ Church, Oxford. The engraved bookplate appears to be eighteenth century and may well date from the time the book was rebound. At some point the book was withdrawn from the Christ Church library stock, as the word ‘Duplicate’ is written on the bookplate in a late eighteenth century hand. On the title page of the book, to the right of the title, is written in ink the name ‘Robertus Burton’, the date 1600 and a little cipher that appears to be formed from a triangle of three lower case ‘r’s. The date 1600 and the monogram are repeated once again beneath the title. On the reverse of the final page of the book the inscription ‘Robertus Burton’ is repeated again, along with the three ‘r’ cipher but also the date he acquired the book: ‘martii primo 1600’ – March the first 1600. The owner identified by the inscription and cipher was the scholar Robert Burton (1577-1640) a prominent Oxford Polymath in the early years of the seventeenth century. About 1700 books from his library remain and he used this signature and cipher in many of them. 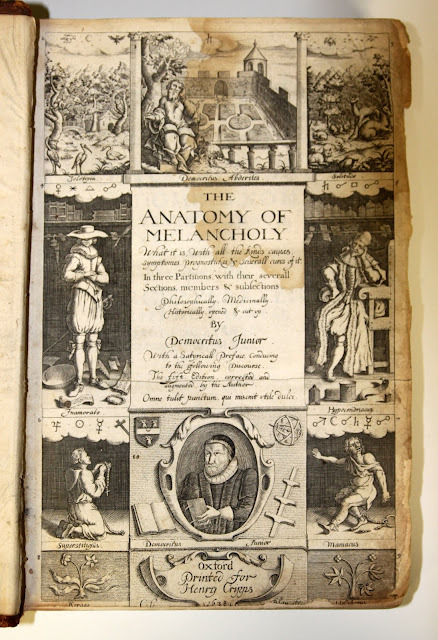 Burton bought this book in 1600 when he was twenty three and was still at the beginning of his academic career, a career that would see him explore Philosophy, Theology, History, Mathematics and Psychology. An undergraduate at Brasenose, at the age of twenty two he had became a student (fellow) at Christ Church and remained there for the rest of his life. From 1624 to 1640 he served as librarian of Christ Church. His tour de force was a book entitled The Anatomy of Melancholy, which he published under the pseudonym Democritus Junior. Published in 1621, it was an extraordinary and ground-breaking work of Psychology; a discussion of the symptoms, causes and cure of the condition of Melancholy. It was a hugely influential book in its time. We have a copy of the 1638 edition here in Lampeter in the Phillips collection (Phi 01502) and the frontispiece is illustrated here, including the potrait of Burton labelled as 'Democritus Junior'. On his death in 1640 Burton was buried in Christ Church Cathedral in his college, where his monument can still be seen, with a portrait bust once again labelled 'Democritus Junior'. Burton's personal library of around 1700 titles was split between the Bodleian and Christ Church, the Bodleian getting first pick. 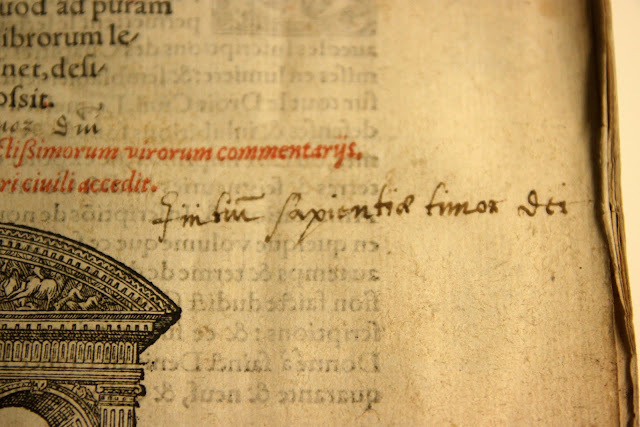 This is how his copy of Virunio came to be in the library of Christ Church, although this book is not recorded among his collection in the monograph on his library published in 1988 by Nicolas Kiessling. We don't know quite how this book got from Christ Church library to Thomas Burgess’ collection, but we can speculate. 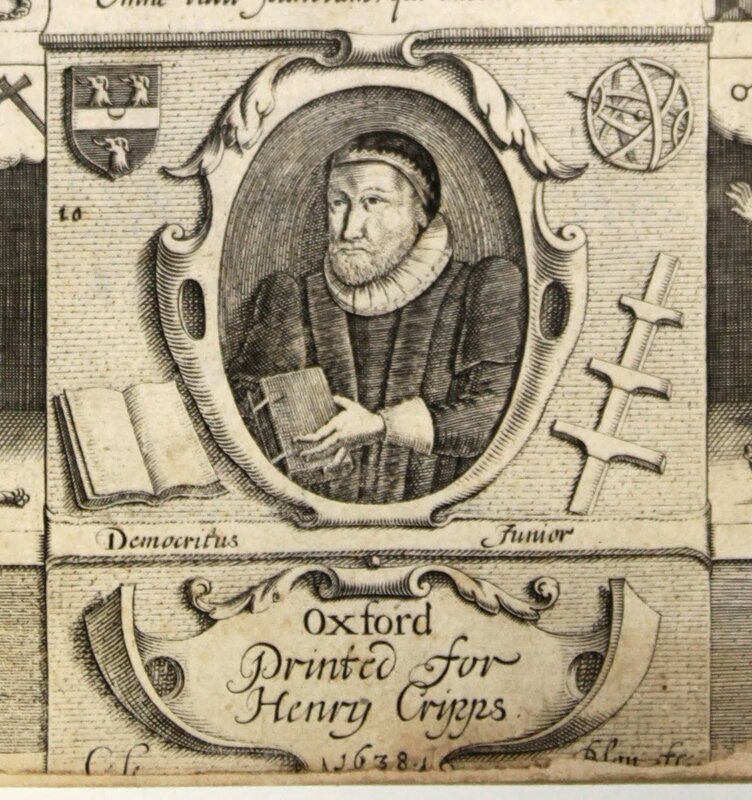 As stated earlier, the Christ Church bookplate has the word ‘Duplicate’ written on it. We know that the librarian at Christ Church was weeding the collection and disposing of duplicate books (including some of Burton’s) between 1789-91. Some were sold to a London bookseller called Thomas King who sold them on in 1793 Perhaps Thomas Burgess picked up the book in that sale? Personally I think Burgess probably picked the book up earlier when he was resident in Oxford. He was an undergraduate at Corpus Christi college from 1775 and was subsequently a fellow of the college, only leaving Oxford permanently in 1791 when he moved to Durham. Corpus Christi College is just outside the back gate of Christ Church, close to Peckwater Quad and to Christ Church library, It would be nice to think of Burgess wandering through Christ Church sometime between 1789-91 and having a rumage through a library book sale and returning triumphant to his rooms with this wonderful prize. N. Kiessling, The Library of Robert Burton, (Oxford, 1988), p. xviii. N. Kiessling, The Library of Robert Burton, (Oxford, 1988), p. vii. N. Kiessling, The Library of Robert Burton, (Oxford, 1988), passim. N. Kiessling, The Library of Robert Burton, (Oxford, 1988), p. xv.